This exhibition showcases the prodigious skills and artistry of Jeremy Adams, one of the most gifted musical instrument makers in New England. Photographs by Paul Cary Goldberg complement the instruments and document Adams’s studio and work process, highlighting some of the exquisite detail and workmanship on individual pieces and underscoring the breadth and volume of his work. 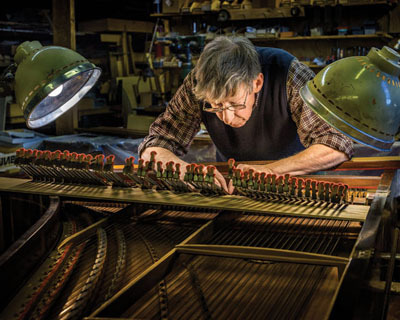 The exhibition, which will be held in the Cape Ann Museum’s 1,500 square foot special exhibitions gallery, will include a one-stop chamber organ, a demonstration organ chest, a 1995 clavichord and a selection of harpsichords, each built in its entirety by Adams in his Danvers, Massachusetts workshop. In addition to the instruments that will be shown in the gallery, a selection of Adams’s furniture will be displayed in the Museum’s 1804 Captain Elias Davis House, offering an interesting contrast to the period furniture in the House.